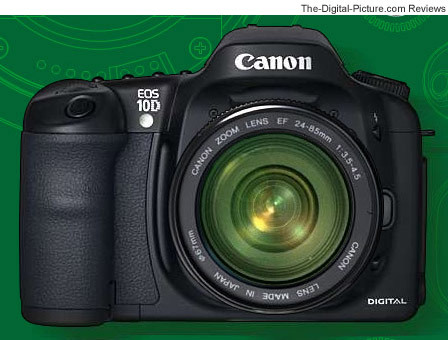 Note: The Canon EOS 10D has been replaced by the Canon EOS 20D. The Canon EOS 10D was introduced at an unheard-of-at-the-time price with some nice incremental advances over its predecessor, Canon D60. Here are some of the changes ... The 10D focuses faster and in low light. ISO 3200 is now available. The 10D's illuminated LCD panel makes night photography easier. The mirror/shutter lag time is fast and quiet. The 10D body is made of Magnesium alloy for a solid feel and rugged build quality. Exposure on the 10D improved over the D60 and the auto white balance setting seems to be more accurate. The image review zoom range on the 10D is extended to greater than 100% - the digital photographer can determine if his/her shot was in focus and sharp without uploading the picture to a computer. Although the 10D features an APS-C sized sensor, it is only compatible with EF lenses (those designed for full frame cameras), as EF-S lenses had not yet been introduced when this EOS camera body was released. Carrying over from Canon D60 was the superb 6.3 megapixel sensor. The 1.6 "field of view crop factor" (the sensor is smaller than a 35mm film back - the outer 40% or so of the lens is not used) makes this camera perfect for nature photography. Keep into mind that focal lengths listed for digital pictures taken with this camera should be multiplied by 1.6 to get their 35mm equivalent focal length. Getting a wide angle lens for the Canon D10 is a somewhat significant issue if that is your interest. The Canon 17-40 f/4.0 L lens or the Canon EF 16-35mm f/2.8 L USM Lens might interest you for wide angle photography. The 10D also retains the Canon D60's excellent long, low-noise exposure characteristics. It is a leader in digital night and low-light photography. The name for the 10D brought some confusion in the marketplace. It is the 10D - not the Canon D10 (like the D60). Hopefully that has been settled for all future models! Autofocus accuracy is the feature I would like to see improved on the 10D most. I get mostly correctly-focused shots with the 10D (when I do my part properly), but there are some that the camera should have gotten right but didn't. The same autofocus mechanism in the 10D has been used in the Elan 7 for many years. There were no complaints about autofocus on the Elan 7 - why is autofocus suddenly an issue on the 10D? I suspect that most people using the Elan 7 seldom create enlargements - simply choosing the inexpensive 4x6 prints that are in the standard processing packages. With digital photography, most people are scrutinizing their shots much more - and enlarging to 100% on their monitors. Viewing a 10D shot at 100% would be the equivalent of a very large print. All of the tiniest flaws are readily visible. I lose a few shots due to the 10D autofocus, but not that many. The way to get better autofocus is to upgrade to a Canon Pro camera such as the Canon EOS-1D Mark II - which I have done. Once again, when coupled with the best of the Canon lenses, the results from this Canon are excellent. The digital pictures from the Canon EOS 10D are amazing. Images have very low noise for a smooth, pristine look - and they are very sharp.